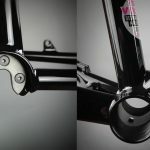 A few weeks ago we published details about the new bike brand and their first bike frame – the Vulture. The Brighton based company had us quite excited as, on paper at least, the Vulture frame and fork looked like a seriously good bargain. 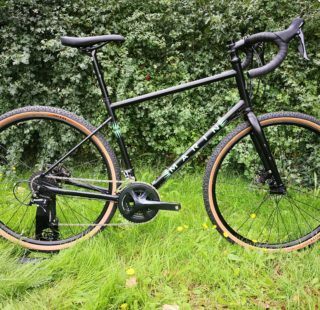 With gravel/adventure/monstercross (delete as applicable) being all the rage, every bike brand under the sun wants a slice of the coolest, trendiest cake right now. As befits all new commodities, prices can be high and occasionally the quality less so. Such is the pressure to have a stake in the game. 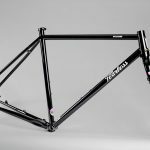 Fearless are marketing a Reynolds steel frame and fork, for under £500. That alone deserves attention, but how does it measure up in the real world? 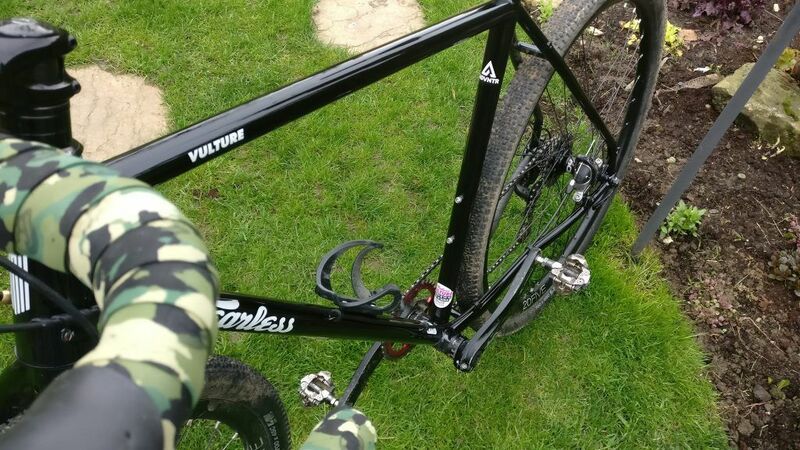 Fearless Vulture is available as frame and fork only. Our build was a mixture of road and MTB components from Shimano. Fearless owner and designer, Tim Cokayne rocked up at our offices aboard a freshly built example for us to play with. 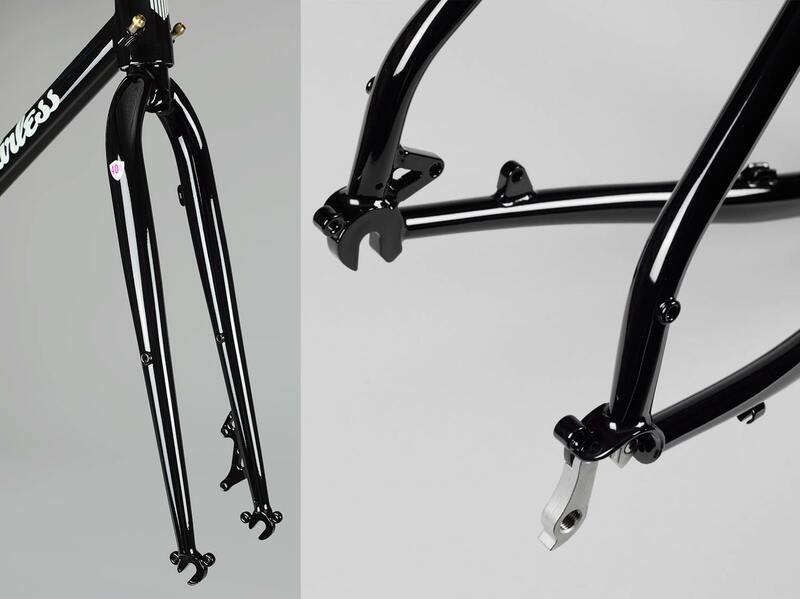 As the Vulture is frame and fork only at the moment, we won’t spend too much time concentrating on the build kit. 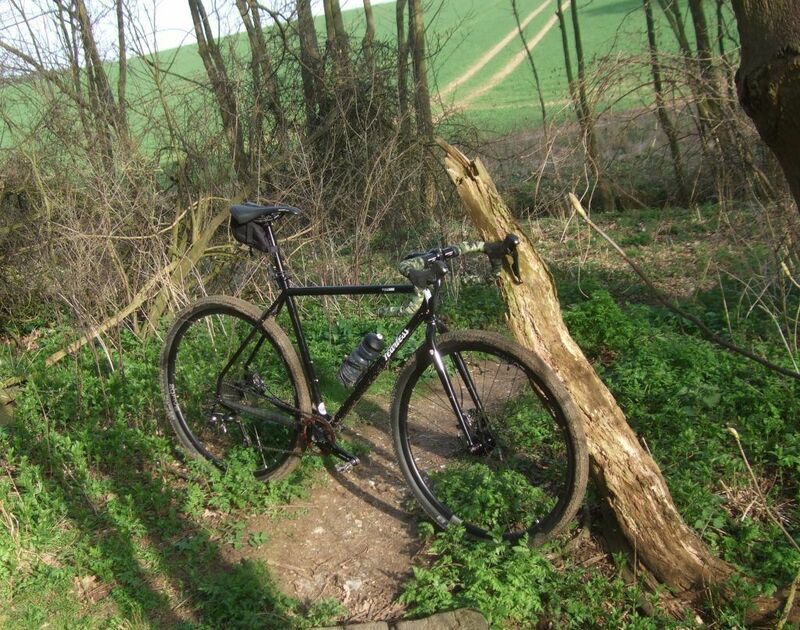 It was an eclectic mix of Shimano XT, 105 and Ultegra, rolling on a set of Hope XC wheels. Tyres were 700x45c WTB Riddler. Tim’s cycling background started with mountain biking in the early ’90s. When ‘Adventure’ eventually took hold of him, he started to ride greater distances, culminating in cycle tours of the US, Asia and Europe. The Vulture was designed to be an ‘everyman’ bike. 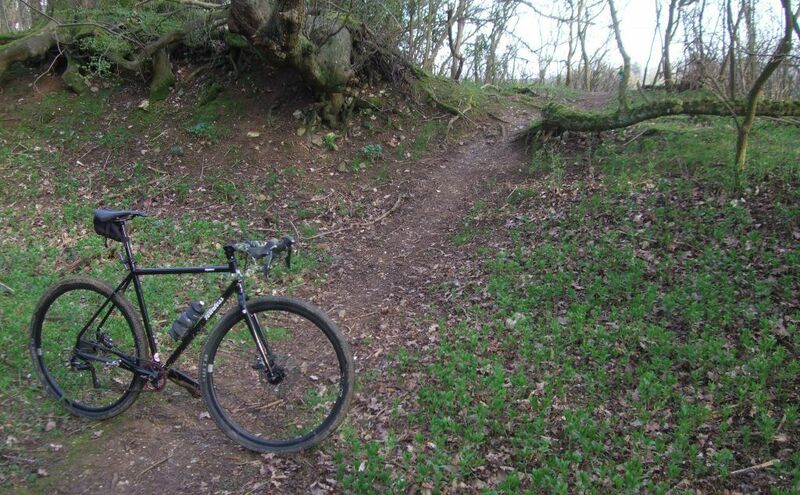 A long distance machine which could still be fun when you just want to rally the local trails. Any trail, any condition. The Fearless Vulture has a playful nature but can also be a restrained tourer. Just a few examples that show the quality and thought that went into the design rather than building it to a price. Replaceable mech hanger and (rejoice) threaded BB shell. 404 fork and a close-up of those cowled dropouts. Just looking at the bike, there is nothing flashy about it. It looks just like a bike, albeit one with contemporary influences. It is basic, practical and workmanlike. In a word: ‘honest’. Frame: Reynolds 725 heat treated main tubes. Fork: straight blade 4130 Chromoly steel with mid blade rack mounts. Weight is 2.1kgs for the ML/54cm frame. The 404 fork weighs 1.1 kgs with an uncut 300mm steerer. 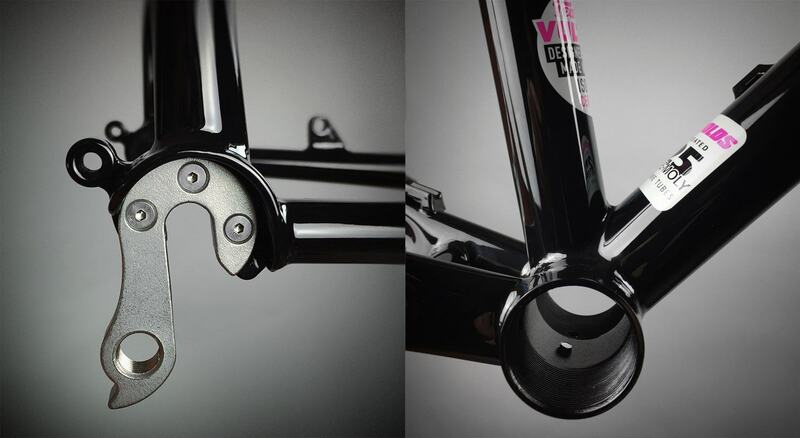 The frame and fork stick with the 9mm quick release standard. There is something aesthetically pleasing about the old skool approach. The bulky drop-outs used on 12mm and 15mm bolt-through axle standards may be stiffer but they aren’t as elegant. Nods to modernity are predominantly sensible ones with the main standout feature being the tapered headtube. 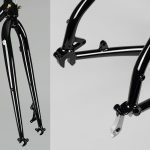 This allows you to upgrade from the standard steel fork to a lighter and stiffer carbon option if that floats your boat. 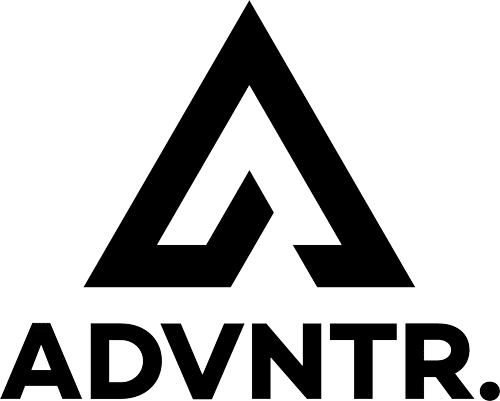 Our example was finished in a gloss black powder coat which has maintained it’s shiny appearance during its stay with ADVNTR. However, powder coat scratches easily and we have spotted a few wear marks already. If you are precious about such things, you might consider treating your new frame to some helicopter tape before you build it up. For the rest of us, we’ll be happy to display our battle scars with pride. 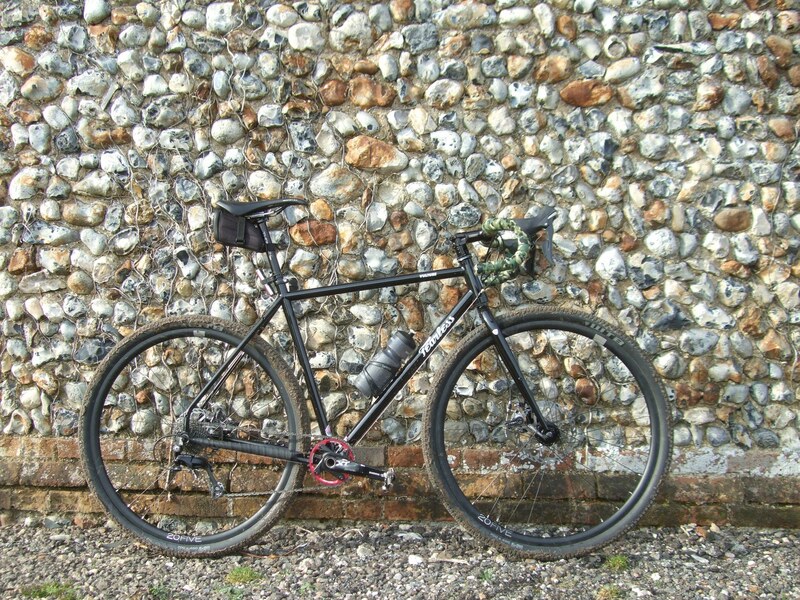 In true ADVNTR style, we’ve tested the Vulture on roads, bridleways and singletrack trails. 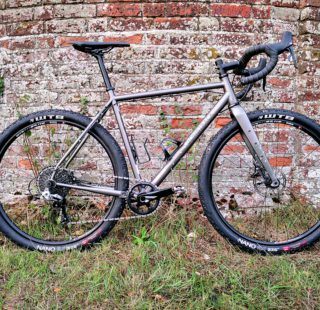 Notwithstanding the component choices, the ride is just what you’d expect from a good, steel, frame. Lively, springy, almost sprightly while absorbing some of the trail chatter. There is a world of difference between a good and a bad frame, however much you pay for it. Well thought through design and tube selection will translate into the iconic, steel, ride. Get it wrong and you will feel every ounce as dead weight. The Vulture is very much alive. It is responsive and translates your power into forward motion instead of absorbing it like a sponge. On trails, the Fearless Vulture is in it’s element. To my surprise, the fork wasn’t the ‘noodle’ I expected. 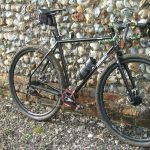 You can provoke a little flutter under heavy and deliberate braking, but I never felt the need for a bolt-through axle or even carbon blades. Steering is direct and the fork is plenty stiff enough without being overly so. If I was building up a Vulture myself, thoughts of upgrading to a carbon fork would be very low on my priorities. On singletrack trails, the playful characteristic that designer Tim fought so hard to build into the frame really shines through. Thanks to the relatively short chainstays and compact wheelbase, you can hustle the Vulture round swooping trails as if on rails. 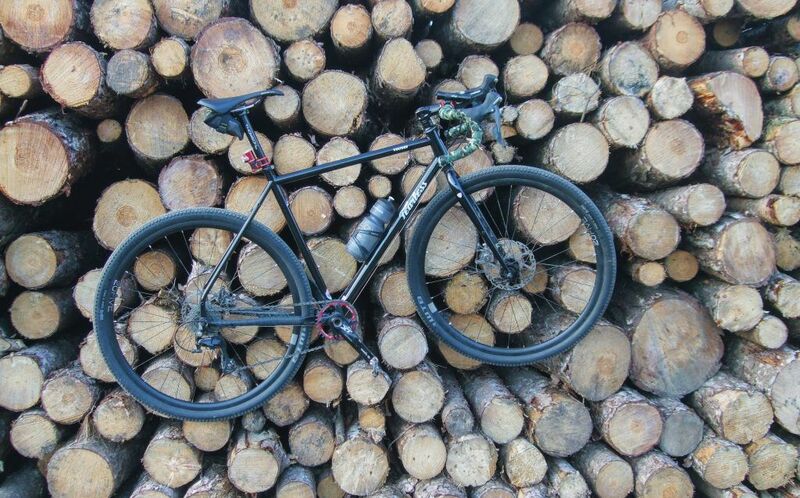 Weighing in at 10.30kg, our test bike is far from an athletic build. You really don’t notice it, to be honest, as the frame not only puts down power effectively, it keeps its’ speed too. I’ve been unfairly criticised in the past for slating steel bikes for being heavy. The Vulture just goes to show that, if a frame is designed right, weight is not a big issue. The Vulture is a frame that is designed “Just Right”. The frame and fork have the clearance for 700x45c tyres. That isn’t just a boast, they not only fit, but even when ridden in very muddy conditions there is plenty of room. The WTB 700x45c Riddler tyres that came fitted to our test bike and combined well with the dampening qualities of the steel frame to produce an almost magic carpet ride. 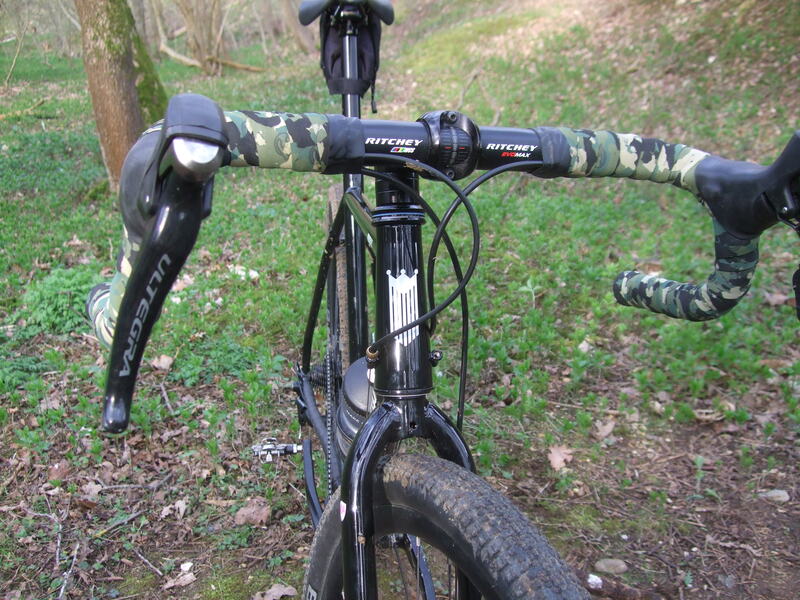 Tapered headtube means the Fearless Vulture can accommodate a carbon fork. That nimble feeling also translates well on descents and the bike feels planted and controlled. Quick direction changes do little to unsettle the handling and the overall impression you come away with is one of confidence. Climbing is also pretty good buth the short wheelbase encourages you to concentrate on weight distribution and technique to prevent all your power ending up as wheel spins. On the road, the Vulture behaves like a typical steel tourer. It’s confident rather than racy and for cruising country roads in between sessions of getting raucous on the trails, it is perfect. You could fit it with some slick tyres and quite easily double up the Vulture as a competent and comfortable long distance road bike or tough commuter hack. Understated graphics lend a classic look to the frame. During our time with the Fearless Vulture it has never failed to impress those who rode it. It really is a competent bike that can lend itself to so many applications. Add the playful nature of its’ handling and this could be the only bike you need. Take it to work during the week as your faithful commuter, head out on the local trails at the weekend and grin from ear to ear. Load it up and go off on an a bikepacking holiday. It’ll do it all. 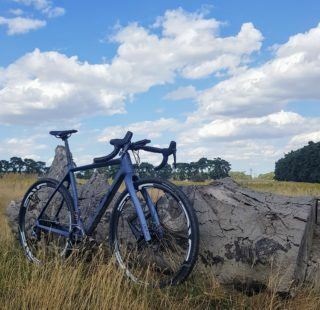 For £499 delivered, the Vulture is competitively priced and however you choose to build it up, you’ll end up with a bike you can be proud of. The attention to detail that has gone into its creation and the quality of the final product makes this one of the top products, in its price range, we have seen so far this year. 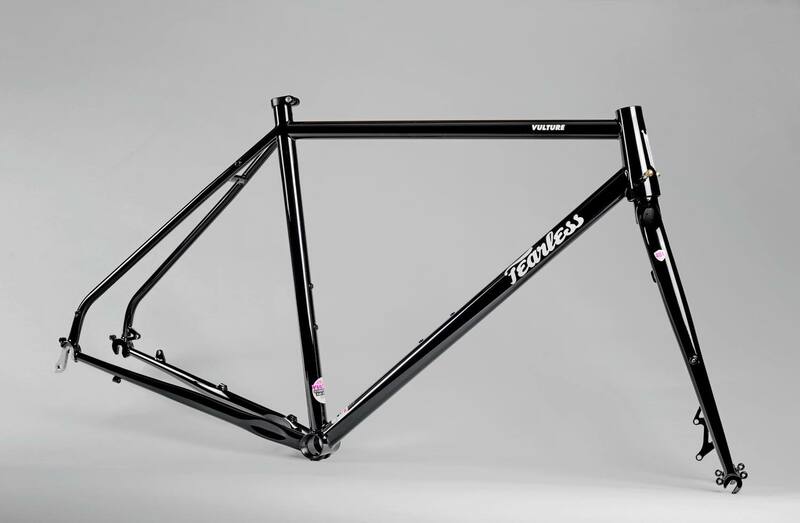 Fearless prove that a budget steel frame doesn't have to be numb and lifeless. 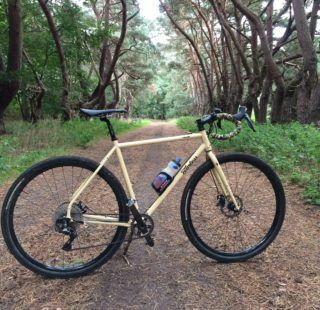 The Vulture ticks all the boxes for a versatile, multi-use bike build.